Through this project we work with Scottish central and local governments on the development of Energy Efficient Scotland. Our research asks what can be learnt from the experiences of 25 pilot projects led by local authorities across Scotland to support delivery of Scotland’s Climate Change targets for 2020 and 2050. The project, led by Prof. Jan Webb and Dr. Faye Wade, is funded through Scottish ClimateXChange​. We also work closely with Energy Savings Trust, who are leading on technical monitoring of the pilot projects. Dr. Ruth Bush worked on the project until mid-2018. In 2015, Scottish politicians designated energy efficiency as a national infrastructure priority, with plans to improve the standards of thermal comfort in every building in the country – commercial, public and residential – and to reduce the need for heating. At the same time, Scotland’s climate change plans mean an end to the use of fossil fuels, including methane gas, for heating. Energy Efficient Scotland, formerly known as Scotland’s Energy Efficiency Programme (SEEP), is the ‘cornerstone’ of Government policy for reducing the need for energy and decarbonising heat supply in the residential and service sectors. 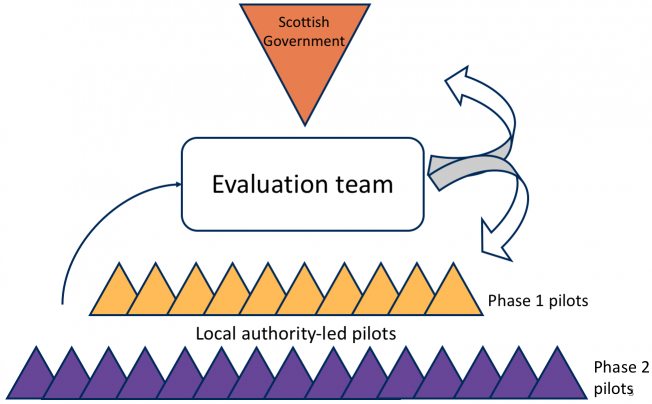 Working in close cooperation with Scottish central and local governments, this project considers aspects of the pilot projects’ governance, management, partnership structures, and resulting behavioural impacts. It will analyse the effectiveness of the chosen delivery approaches in terms of their replicability and scalability given the diverse geography and socio-economic circumstances of Scotland’s communities, and the challenges of regulation and standards, skills and supply chains. We aim to generate relevant lessons to inform the work of both Scottish Government and local authorities. The evaluation is informed by a mix of quantitative and qualitative data. This includes technical monitoring data of energy consumption, temperatures, and humidity in the buildings targeted by the local programmes. Social and organisational data is also being collected, including surveys with building occupants and in-depth interviews with key delivery actors. The data follows the progress of the projects from pre-installation of measures through to post-installation.